In order to create custom content for Wesnoth, you need to know where the game's resources are and where to put your own. This page will explain how to find both the data (core game resources) and userdata (custom content) directories, as well as an explanation as to working with each one. The simplest way to find your game and userdata directories is to go to Preferences → General → Paths (shown on the right). From here you can copy respective the paths to your clipboard or open them in your platform's file manager. If you want more detailed explanations on the specific locations for your specific system, you can read the How to get there sections below. Wherever you installed the game, you will find these folders, among others: data, music, sounds, images. The rest are unimportant unless you're a developer looking to tweak stuff about the game itself. Besides data, they contain resources used by the game, not by campaigns. Inside the data folder you will find , among others, these folders: campaigns, multiplayer, core. These contain the mainline campaigns, the multiplayer maps and scenarios, and all the resources used in add-ons. You may examine the contents of the former for reference on how the campaigns and maps included in mainline are coded. In core, you will find another set of music, sounds, images directories. Look in here to find resources for creating your UMC content. NOTE: These folders are NOT the place to put your own resources when creating an add-on. You should keep them in your add-on's folder the userdata directory, as detailed below. 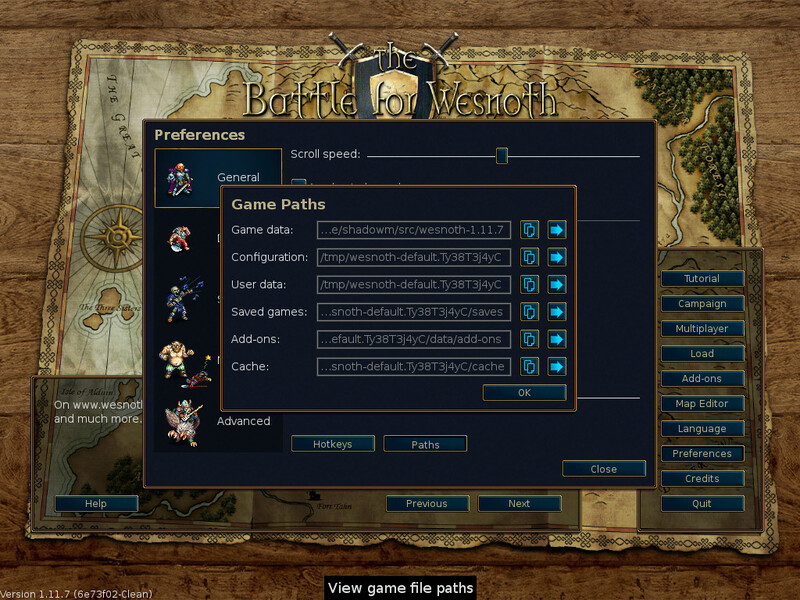 In this wiki, the terms "game data", wesnoth/data, or ./data refer to the wesnoth/data directory. The terms "core folder" or core refer to the wesnoth/data/core directory. Note: C refers to the partition or drive where Windows is installed. If your copy of Windows is not on C, or Wesnoth is installed in a different location, the path may not match those given above. If you don't remember where you installed the game, right click on the game's shortcut, open Properties, and click on the "Find target" button. Control+click on the application icon. Select "Show Package Contents", then navigate to "Contents" → "Resources". In a terminal, the command wesnoth --path shows the game data directory. The command wesnoth --path also works. The user data directory in particular is the most important to a content creator. Inside are your preferences file, custom maps, saved games, the WML cache and data files corresponding to user-created content. In this wiki, "user data" and userdata/ refer to this directory. The add-ons directory is particularly useful. In order to work with custom scenarios or campaigns, you will need to have your own add-on set up here. Instructions on how to do so can be found in AddonStructure. Several pages on this wiki will assume you have done so and refer to relative paths in such. Note: The above only applies if you did not select "Store userdata in the install location" when installing the game. If you did, keep in mind that on Windows Vista and later writes to the userdata directory in the install location may be silently redirected to the "Virtual Store", typically C:\Users\yourname>\AppData\Local\VirtualStore\Program Files\Battle for Wesnoth <version>. Virtual Store is hidden by default; it can be accessed by by typing "shell:local appdata" in Explorer's address bar. Note: As of OS X 10.7, the Library folder is hidden by default. You can press the Option key and choose Go to access it, or choose Go > Go to Folder… and type in the path there. In a terminal, the command wesnoth --config-path shows the user data directory. This page was last edited on 12 August 2017, at 03:43.